With combined decades of experience in both offline and online marketing models, our team has positioned Lead Genesis as a premium destination for high quality lead products. Our emphasis on quality control involves a strict internal verification process to filter out any non-qualified lead prospects. We control almost every aspect of the lead generation process…driving high quality traffic from our network to our own hosted offers and delivering through our technology platform. Lead Genesis has been a market leader and innovator in the residential solar space since 2011. We work with large providers, independent contractors, and everything in between. Lead Genesis sets itself apart by engaging in large scale national media buys. We buy media through channels that are simply not options for even our largest clients because of regional limitations. It is for that reason that we are able to target consumers that our clients cannot reach through their internal marketing efforts. We stand by our service by charging no set up fees and offering the most lenient return policy in the business. Lead Genesis pricing is entirely based on demand and starts at $5 per lead. There are no set up fees and we offer a lenient return policy to protect your investment. We understand your cash flow needs and offer flexible credit terms to established partners. Click here to get a quote. Lead Genesis has a limited supply of leads and pricing is based on demand. Pricing can range from $5 – $300 depending on the lead product, filters, and demand. Give us a call today at (800) 314-5070 to get a free consultation and up-to-the-minute pricing in your area, or click here to sign up now. Lead Genesis provides exclusive solar leads across all 50 states and Puerto Rico. We do not buy search traffic, which can often compete with our clients' internal marketing efforts. We strategically leverage national media buys across direct response channels only. This ensures that consumers we reach are truly exclusive to our quoting process. 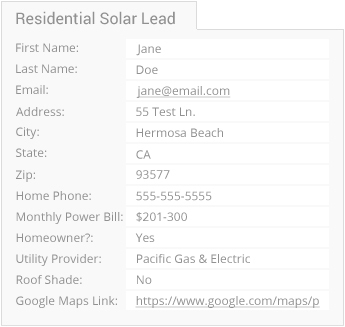 Lead Genesis provides competitive solar leads in most states. We offer our clients the most profitable economics by offering highly qualified leads at a low price. By controlling the market the consumer shops in, we are able to create a "win win" situation for both the consumer and our clients. Competitive leads are sold on average to less than 3 buyers. Lead Genesis can deliver live consumers over the phone to your sales floor. Working with several call center partners, Lead Genesis can deliver "hot" transfers at scale in all 50 states. We can implement custom scripting and pre qualifications to your standards...and offer our industry leading return policy as insurance on your investment. Lead Genesis can source appointment sits through its network of affiliated call centers. These appointments are guaranteed and are also offered in all 50 states. Start growing your solar business with Lead Genesis! We offer flexible payment terms, money back guarantees, and industry leading service. Lead Genesis is the best choice for your solar leads, do not hesitate, sign up now and join our many happy customers.